I have some questions, first of all, does anyone knows a way of installing the original GPM in Windows 10? 'Cause, well, to be honest, mine's doesn't allow me to actually install it; I know the DOSbox thing, but I want to know if anyone actually could install it on the W10. GPM1 is tricky to run on modern PCs since it's a 16-bit Windows program, and support for those is not included in any 64-bit versions of Windows as 64-bit processors cannot directly emulate 16-bit Windows commands. So in 64-bit PCs an emulator - a virtual machine - for an older Windows version is always required to act as the middle man. 32-bit versions of even the most modern Windows should be fine without having to use a virtual machine, but they are getting increasingly rare. So unless you have an older PC with a 32-bit WIndows or want to go through the lengths of making a second boot partition just for one game, virtual machines are your only option. It's a good thing EdCom updated the game engine to then-state-of-the-art 32-bit for GPM2, otherwise it probably wouldn't be as popular today! Ever wondered why the file containing GPM2 driver faces is called HELM1.EDY? 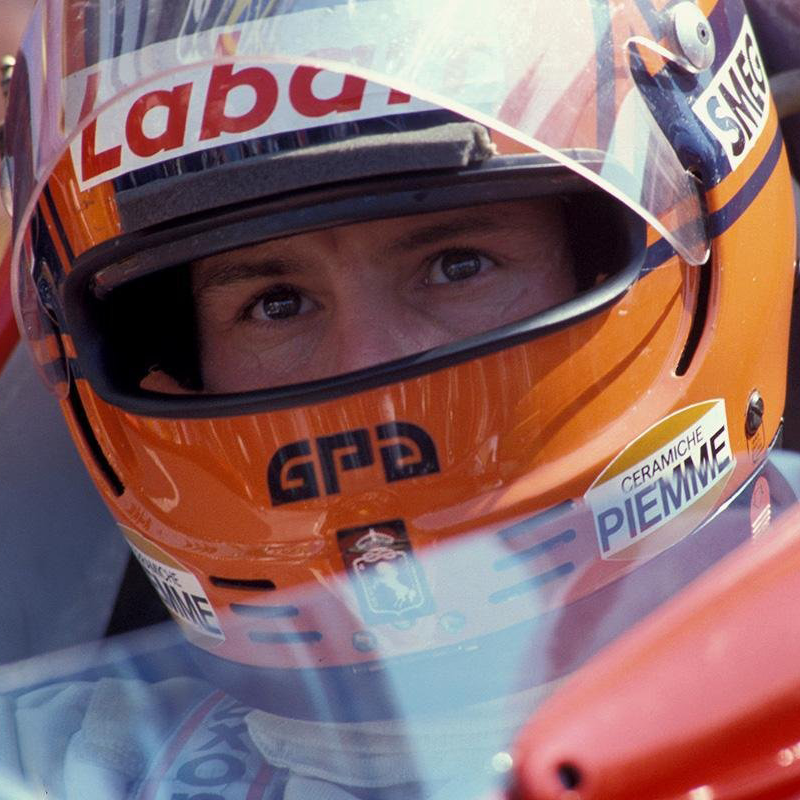 That's because it's recycled from GPM1 which used drawings of driver helmets instead. So by exporting that file to BMP it's possible to replace the helmets with custom driver faces, then import them into the game by re-converting the BMP to EDY. Naturally the same process can be applied to any other EDYs that need to be edited such as car graphics. Basically it's the same thing as what Starfire Editor does for us in GPM2, but because it has no GPM1 support all of the work has to be done manually. Team names, team personnel, points system, engine names and quality can be edited in-game. The in-game driver editor is primitive and only allows you to change the driver's name, skills, car number and base salary. Age, nationality and bonuses cannot be edited unlike in GPM2's in-game-editor. Season calendar cannot be edited at all. However, I've already found quite a lot of editable stuff from the GPM1 config and executable, including engine weight and power as well as full driver stats (minus nationality and championships). So watch this space! Nuppiz wrote: GPM1 is tricky to run on modern PCs since it's a 16-bit Windows program, and support for those is not included in any 64-bit versions of Windows as 64-bit processors cannot directly emulate 16-bit Windows commands. So in 64-bit PCs an emulator - a virtual machine - for an older Windows version is always required to act as the middle man. 32-bit versions of even the most modern Windows should be fine without having to use a virtual machine, but they are getting increasingly rare. So unless you have an older PC with a 32-bit WIndows or want to go through the lengths of making a second boot partition just for one game, virtual machines are your only option. Oh, sad thing then. I own like, 2 PCs with both W10 in 64-bits, so, RIP my hopes of actually even being able to install it ('cause all I have of GPM is an ISO), but well, I guess I'll need to find the game actually installed (and cracked?) and also a DOSbox tutorial (again, 'cause last time I used it was like... Years ago, just for Grand Prix 2). And, wowser, I never thought of the .bmp to .edy thing (though I was actually planning to do some research to edit some sponsors of the Hybrid era, such as Monster Energy or the new Marlboro's image: Mission Winnow), but that's quite impressing, just to see how many stuff can actually be edited from the original GPM. And, well, it's sad to see that there are some factors that cannot be edited manually, but I'm pretty sure there will be a way to actually manage to edit 'em; I mean, if my memory doesn't fail me, the original game allowed you to go to 2035 with the "long career", while GPM2 only allowed you to go 10 years (?, I don't know, I only reached the end of GPM2 like twice?). But well, I hope in the future we can actually have a "GPM 1995 Real" mod, like the original mod of 1996 for GPM2, or others like 1994, 1991, or who knows! Just a quick update that after a long hex editing session I managed to find the addresses for number of championships and driver nationality in the config file. Weirdly enough they were quite a distance away (in terms of hex addresses) from the other stats. As a bonus I also found driver contract lengths! Nuppiz wrote: Just a quick update that after a long hex editing session I managed to find the addresses for number of championships and driver nationality in the config file. Weirdly enough they were quite a distance away (in terms of hex addresses) from the other stats. Ah, you see that's the tricky part I mentioned. What is actually happening is not GPM1 running directly through DOS, rather DOSBox is making such a good job at emulating DOS that it is running a Windows 3.11 which in turn is running GPM1! Nuppiz on GPM2World wrote: Grand Prix Manager 1 in Windows 64-bit! No I'm not lying, I actually managed to get GPM1 working under the 64-bit Windows 7! Although it was quite tricky. As you can see from the top bar, it's actually running under a Windows 3.11 system which, in turn, is running under DOSBox. But how did I do that? 2. Unzip the installation files in the same folder where you'll eventually install the old Windows. Then, go to DOSBox, and mount the virtual drive to the same folder. Start the installation process (by first going to your virtual drive by inputting C: (or the equivalent station letter if you used another one), then inputting cd Win311 (or the equivalent folder name if you changed it) and finally inputting setup. 3. The setup program should start. At this point it is strongly advised to increase your CPU cycles (CTRL+F12) to make the setup progress quicker. Select "Express Install", and press Enter a couple of times. The installation process should now commence. Don't try to install any network adapters or printers. After everything's been installed, simply click either one of the buttons in the final screen & exit DOSBox. 4. If you haven't yet done it, copy the GPM1 folder to the same location with Windows (not the actual Windows folder, but beside it). Also, unpack and copy these crucial WinG drivers to the old Windows' SYSTEM folder: https://www.mediafire.com/file/h2t9opb7 ... M.zip/file. Then, go to DOSBox's configuration and find a line called "machine=". By default, it reads "svga_s3"; change this to "svga_et4000". Save the configuration and start up DOSBox again. 5. Go to the fresly-installed Windows folder (it should be like C:\Windows), and input setup again. You should be able to modify a variety of preferences. What we need to modify is display; select it with the arrow keys, and press Enter. Select any of the Super VGA options (1024x768, 256 colors, small fonts looks and works best). Press Enter, and the setup will ask you for the drivers. Just press Enter, and after a while the drivers have been installed. The setup program will automatically exit to the command line. Nuppiz wrote: Ah, you see that's the tricky part I mentioned. What is actually happening is not GPM1 running directly through DOS, rather DOSBox is making such a good job at emulating DOS that it is running a Windows 3.11 which in turn is running GPM1! That by no means is the only way to run GPM1 on a modern machine - a VirtualBox/Virtual PC running Win95/98 should do just as fine. It is, though, by far the most cost effective way to do it in terms of disk space. Also, the last time I tried it VirtualBox was actually having some issues with Win98. The complexity of running the game on modern systems is actually why I haven't really researched GPM1 modding further up to this point. 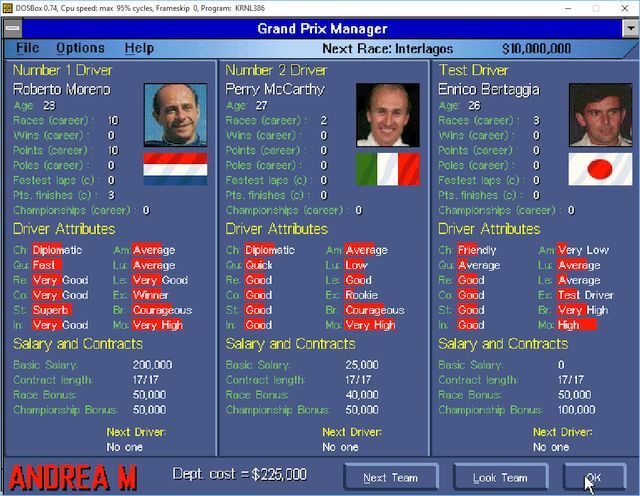 The screenshot I posted was in fact the result of one evening in July 2016 when I was really bored (incidentally also why it has Andrea Moda, because I had a plan of releasing a GPM1 version of the 1992 Mod with all 16 teams). So what your post actually did was it made me return to my notes from two and a half years before! Nuppiz wrote: That by no means is the only way to run GPM1 on a modern machine - a VirtualBox/Virtual PC running Win95/98 should do just as fine. It is, though, by far the most cost effective way to do it in terms of disk space. Also, the last time I tried it VirtualBox was actually having some issues with Win98. Oooh, so I accidentally clicked into a secret mine and it exploted with lot of great news? Well, if anything, I'd try and help you if it's needed, but... About the people, I mean, there's always the possibility of posting it and, by God's known, we get thousads of download... Anyways!